Want Softer, Shinier Hair? Get Nutty! Hair. Mine is bleached, coloured, gets heat styled probably more often than it really should. Getting my hair to look shiny, smooth and well behaved while feeling soft and silky is a huge challenge. Hask Macadamia Oil Hair Care helps. Moisturizing Shampoo is a sulfate free, creamy cleansing treat for parched tresses. This shampoo cleanses thoroughly but doesn't leave my hair feeling stripped or squeaky. While this shampoo is gentle and non drying, my hair feels fresh and bouncy, when dry. Moisturizing Conditioner. Rich, creamy, relatively thick but not sticky or gloppy, this conditioner offers excellent combout with the conditioner in and good slip for combout after blotting. This conditioner leaves my hair feeling amazingly soft, silky and shiny after my hair is dry and has had time to relax for a while. Moisturizing Shine Oil. This silicone/oil combo treatment offers hydration and softening to my stressed, frizzy, damaged hair. As my hair is so dry, I can use a pretty generous amount and my hair just drinks it up! I like to apply before drying or styling. This is a lovely treat for wet bunning, as it gets to stay on my damp hair for a long period and deeply soften and smooth. I put a few drops in my palm, rub my hands together and work it into my length and ends on one side, repeat for the other side, then for the back. I add a little additional to my Cranky Canopy in back and on the sides then run the leftover on my hands over my roots and crown. (I can get away with this because I'm not so oily. If you have very oily hair, keep this stuff on your length and ends.) A little added after styling boosts shine and smooths for a perfect finish. Moisturizing Deep Conditioner. Okay, I have to admit that I haven't used this, yet. No reason, really. I just don't think about it until I'm already in the shower and I'm not hopping out and going streaking for a packet of conditioner. I'll get to it. I also received a cute, pink mini dual bristle cushion paddle brush. That baby was popped directly into my handbag. I've been meaning to buy a purse sized brush for a while but I never think of it when I'm at the store. Now, I have one and I like it. It's nice for quick smoothing and style touch ups on the run. The scent that this line shares is somewhat chemical-y, generically sweet with undertones of nut, vanilla and earth. The scent isn't strong but it is apparent. The shampoo and oil are more strongly scented than the conditioner. I like the scent of the oil, best. The scent lingers for a while after I step out of the shower but it isn't overpowering and does dissipate after a while. If you are sensitive or dislike fragranced hair care, this line isn't going to be for you. 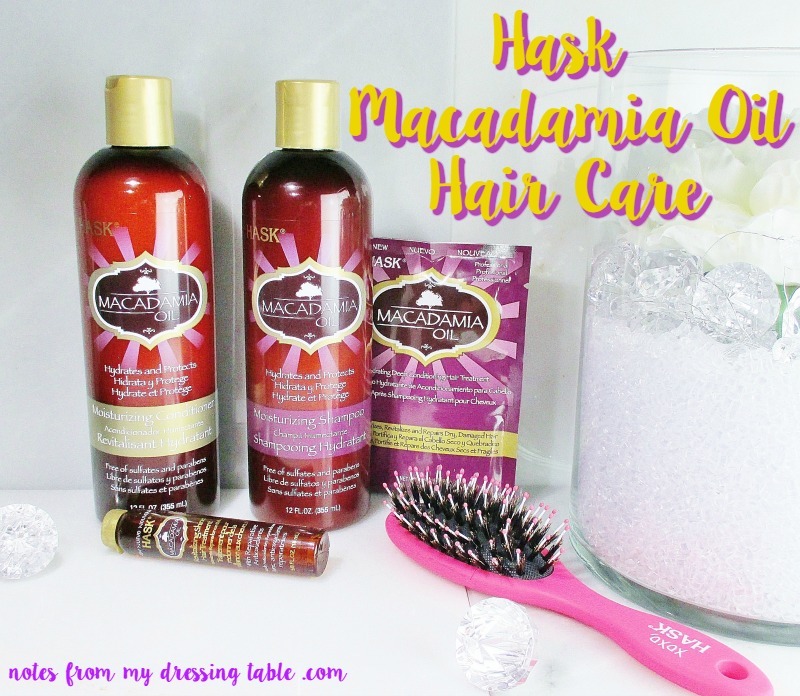 Overall, I like the Hask Macadamia Oil Hair Care line. These are effective, quality hair care products at a good price. I would love to try the Keratin Protein, Coconut Oil varieties and the styling products, as well. You can find more information about Hask hair care here and the products can be purchased in Sally Beauty Supply stores and at Ulta Beauty. Have you tried Hask Macadamia Hair Care or any of the other flavors they offer? What do you think of these products?